Time is running out to hold your spot in this summer’s hottest tactical game, "Operation: End War – The 11th Hour," held at Battlefront Paintball in Hubbard, Ohio, this July 27-28. Real Action Paintball is proud to be the founding sponsor of this revolutionary scenario game, which pits players against each other using only magazine-fed markers in a true test of tactical skill. 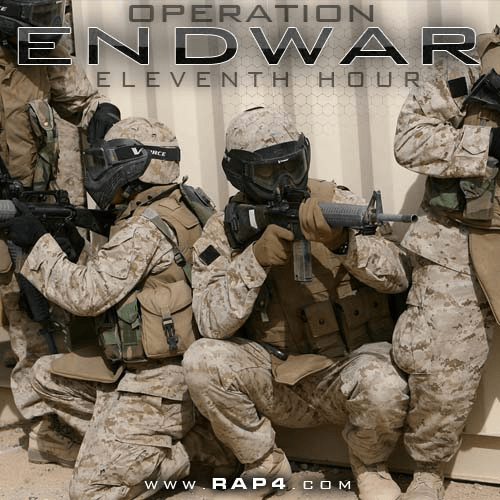 "Operation: End War – The 11th Hour" will be produced by .68 Caliber Productions, who produce a host of wildly popular events throughout the summer. From World War I and II –themed games to this event’s futuristic global conflagration, the staff at .68 Caliber Productions is experienced in putting together topnotch events that players love. .68 Caliber Productions and Real Action Paintball are working hard with Battlefront Paintball to bring this game to life on their extraordinary field…and to reward players with some extraordinary perks. The field is an old gunpowder manufacturing plant that suffered a catastrophic explosion decades ago and was abandoned, left to be reclaimed by nature. 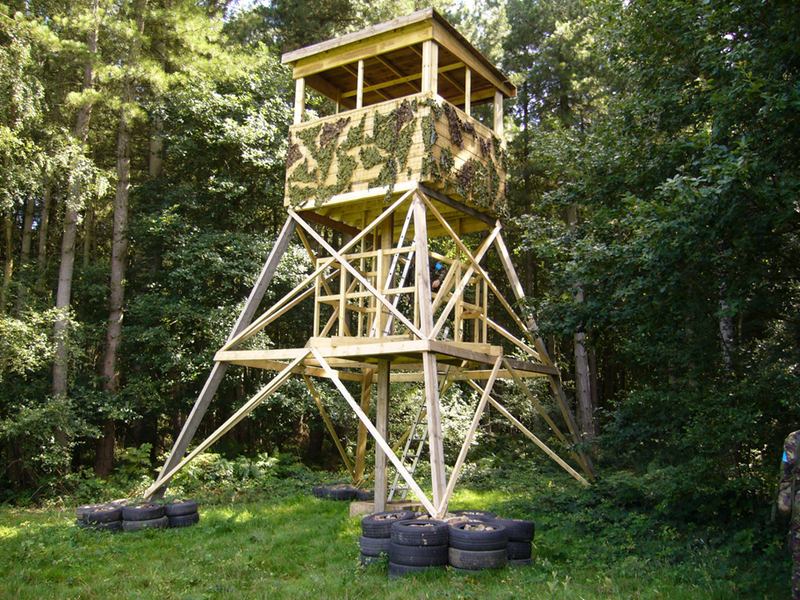 When the field opened, they cut back some of the foliage and carefully created a tactical paintball dream field where partially destroyed buildings, thick forests, log bunkers, watchtowers, and other terrain features combine to make a fantastic post-apocalyptic field that ideally fits the storyline. We’ll get the weekend kicked off on Friday, July 27th, with an amazing clinic put on by local SWAT team members. Check in, pitch your tent – you get free camping access all weekend long with your preregistration – then grab your gear for the "SWAT for Dummies" course. Don’t have a magazine-fed marker to bring to the game? No sweat – you can reserve a mag-fed marker package from RAP4 when you preregister…which is, incidentally, the only way to make sure the field will have a mag-fed marker package for you when you arrive. 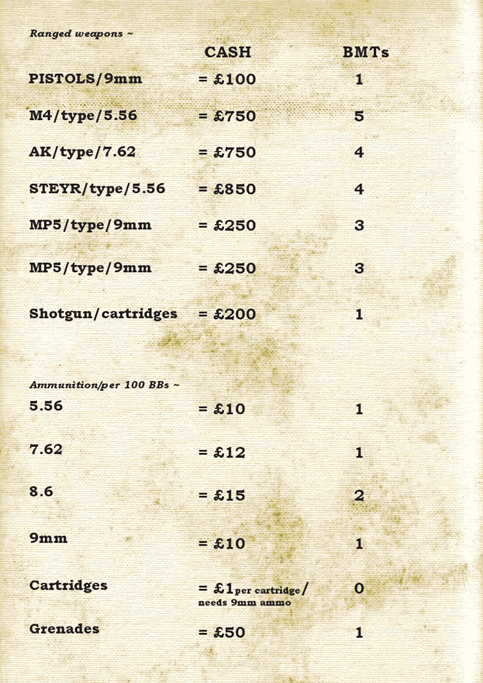 Your rental package will include an MKV mag-fed marker, three magazines, mag pouches, a tactical belt, and an HPA tank. Bring your own goggles or rent some at the field, and you’ll be all set. The "SWAT for Dummies" course will also include an overview on the proper use of your MKV marker, so that when it’s time to run through their drills, you have the familiarity you need to get straight into the action. 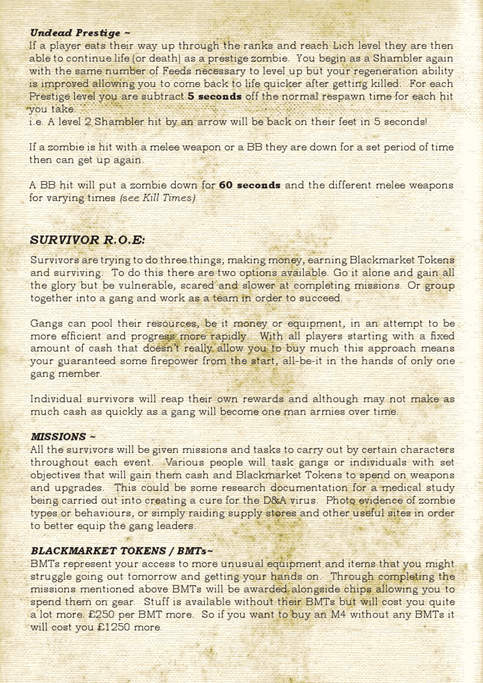 …and once you fall in love with the MKV marker you carried through "Operation: End War – The 11th Hour," you don’t have to leave it behind – you can purchase it after the game, and even put your rental package fee towards the purchase price as a nice discount! Kismayo is a key asset for the Somalian pirate gangs, allowing supplies to reach areas under their control and providing a lawless heaven for their operations, and it is believed that Kismayo harbours the main banking operation channelling ransom money to the Al-Shabaab terrorist organisation, the loss of this facility will de-stabilise the pirate operations on the gulf of Somalia undermine support for Al-Shabaab in Somalia. In the course of their combat operations, Amisom have, however, located several alarming pieces of intelligence that hint towards a large scale Al-Shabaab planned attack on the West. Despite their best efforts they have not been able to gather any further solid intelligence relating to the method or timings of the planned attack. and the possibility of a terror attack on a scale not seen since 9/11, the International Community is now paying much closer scrutiny to the region. An urgently devised Classified U.N mandate is passed to provide JSOC assistance to the Amisom forces, Combat Troops from the U.S and U.K have been put on stand by to be despatched to the region with the operational goal of bringing the Southern port city of Kismayo under the control of Amisom and the Somali Government. 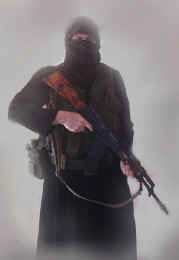 The operation will be a “Black OP” spearheaded by U.K Special Boat Service Troopers and U.S Navy Seals, with the aim of sweeping through the city to locate and secure any intelligence relating to the planned terror attack and, if possible to capture (Dead or Alive) the Al-Shabaab leader Ahmed Abdi Godane. This will coincide with a with an assault conducted by Amisom troops, whose aim is to destroy Al-Shabaab’s operational capability at ground level by targeting the Somali pirate gangs, Al-Shabaab fighters and their assets. Please read this section carefully. The base clothing requirements will be strictly enforced. Please also try and match you’re load carrying gear to the team colours. These guys are pirates. As such they wear predominantly civilian clothing. No loose ammunition is to be carried –all ammo must be carried in magazines, however loose ammunition can be stored at you’re team’s regeneration point and you can replenish your ammo as and when required throughout the day at regen. A maximum 5, standard capacity (i.e. 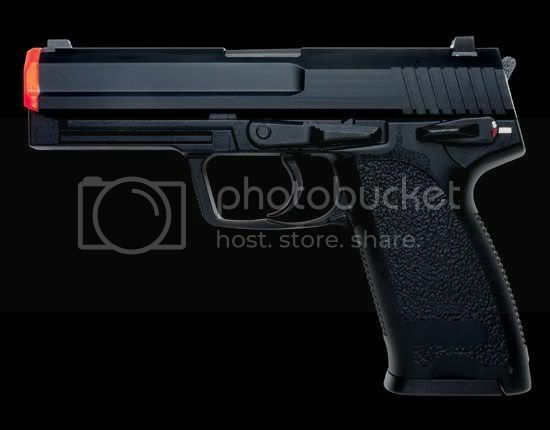 Not extended mags) Magazines can be carried (1 in the pistol and 4 spares). We operate a zero tolerance policy to poor conduct! We will not tolerate cheats! We will not tolerate blind firing! The marshals word is final and arguing will not be tolerated! IF YOU HAVE ANY PROBLEMS INFORM A MARSHAL IMMEDIATELY, NOT HOURS LATER WHEN NOTHING CAN BE DONE! When Hit, a player must leave the playing area as quickly as possible with one hand raised in the air above their head whilst continuously calling “dead man walking”. A hit is classed as a direct strike from a BB on any part of the player and their equipment including the weapon in hand. AEGs/GBB Rifle/Pistol = maximum 350 FPS with .2g BBs. All weapons will be chronographed before commencement of play with 0.20g bb’s and random chronographing will take place throughout the event. Please ensure your weapons is within the limits as any weapon found to be over the FPS limit must be placed back in the player’s vehicle or left in the event office until the end of the event. No exceptions will be made. Any player found trying to cheat the chrono will be immediately removed from the event. You may fire full auto in too/out of a building, but must switch to semi once you are in a building. 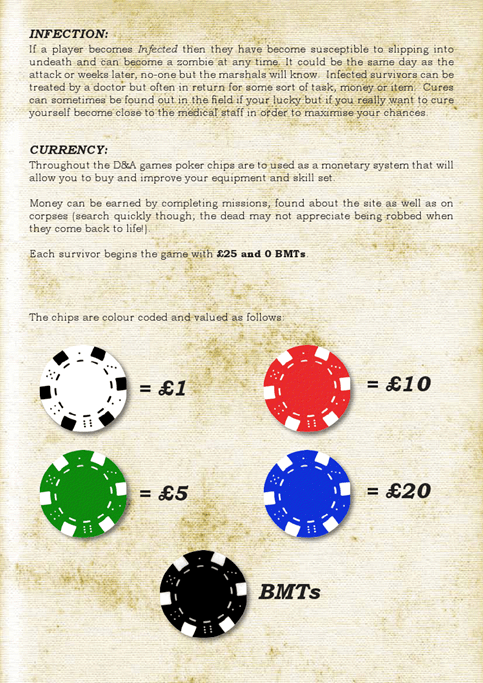 Any medic rules in play will be explained at the event game brief. We do not enforce the BANG rule, but you may use it at your discretion, we do however expect common sense at close ranges! Only pyro purchased from Brit Tac Airsoft will be able to be used at this event. NO MK9 or above allowed! Any player in a room is dead unless behind hard cover. Hard cover is classed as a physical barrier between the player and line of sight of the grenade i.e a wall, not hiding behind the player in front of you! Smoke Smoke is for screening purposes only and does not have any other in game effect. Military smokes are allowed outside of buildings. No military smokes inside buildings. Game effect pyro Any other pyro which has any in game effects will be used and controlled by a marshall, the marshal will inform the players effected and to what extent. 1. Sleep in game. Players that choose to do so must wear their eye protection at all times. 2. An allocated safe sleeping building (if one is available at the event). 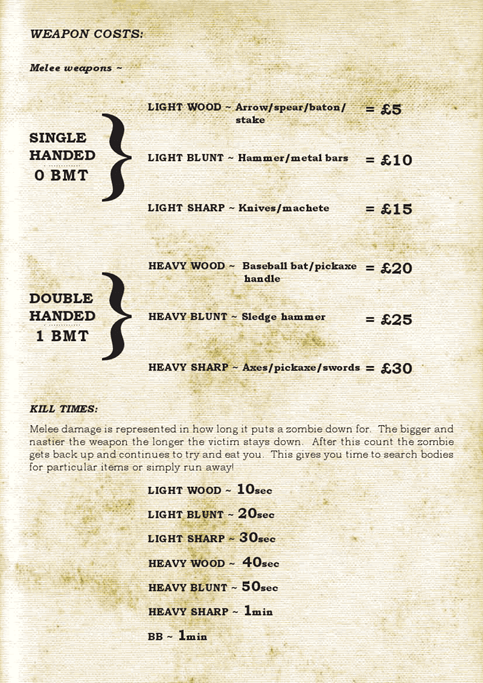 • ALL WEAPONS MUST BE MADE SAFE BEFORE ENTERING A SAFE ZONE! • All players must wear adequate footwear which gives maximum ankle support (i.e. boots, no trainers!). Players are also advised to wear full face masks. This is not mandatory for adults but is a must for those under the age of 16 yrs. Safety glasses to ballistic standard must be worn at all times on the site except in the safe zone. Gloves and a helmet are advised. • All players must ensure whilst travelling to and from the site that their weapons are transported in either a hard or soft case. 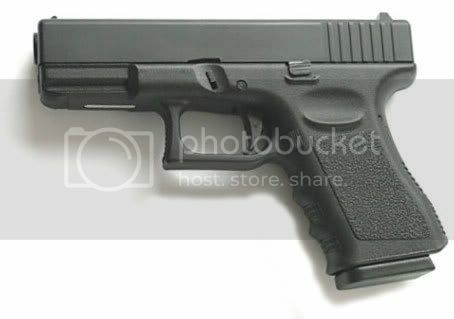 At no time should weapons be visible to the general public. This is for your own safety! • All players must sign in and out when entering or leaving the site. • No smoking is allowed whilst inside any of the buildings but provision will be made for smokers outside of the building. • No green military lasers to be used on site. Low powered red lasers are permitted. • Violence, intimidation and bullying will not be tolerated on this site against players or marshals. Any person committing such an act will be removed from the building and membership will be terminated. • Anybody caught causing non-accidental damage to the site will be held liable for the cost of repair. • Players must not enter rooms/buildings/areas with ‘out of bounds’ signs on or warning tape. • The marshal’s word is final. • All deposits are non refundable, unless we cancel/change the event dates. a £45 deposit is payable via PayPal to secure your place. Please choose your team, state in the paypal comments box, full name,date of birth,Team chosen and a secondry team,contact email address, and contact phone number. 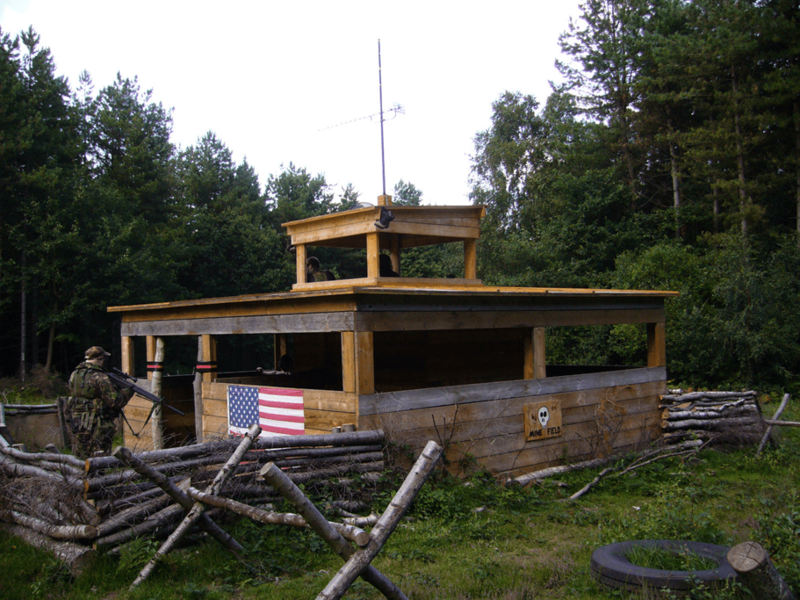 Booking is via email to ivanoorschot@hotmail.com or via the forum on www.brittacairsoft.com. 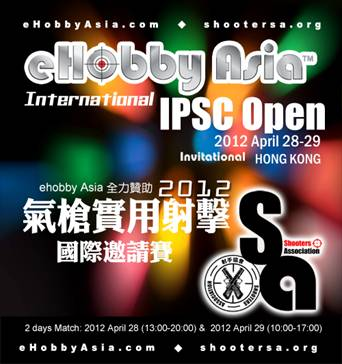 eHobby Asia is going to host an International event for IPSC. Shooter may choose to complete at anytime between the time above, please be aware all stages will be closed sharp at 29Apr 2012 17:00. Dragon Valley Airsoft are running their "Year Of The Dragon" weekender on 2nd-3rd June at Caerwent Training Facility near Chepstow in South Wales. The event will take in a rather larger area of the base than the area used for regular Dragon Valley games. For this year’s event we’ve chosen a present day setting and a WWIII theme; Chinese forces raiding communication hubs around the globe in an effort to erode western dominance of the information superhighway. "Year Of The Dragon" will bring a rolling campaign over an area of 150+ acres containing over 30 buildings and other structures, banks, wooded areas, ditches, railway lines, roads, tunnels, you name it! Gameplay will involve the two sides in a pitched battle for control of key areas, and also for control of the all important communications infrastructure that modern society is so reliant upon. Where would we be without the World Wide Web, social networks, mobile phones and SMS messaging? All of these will be pivotal to success in the "Year Of The Dragon" campaign. Of course, we’ll also be throwing in a big helping of props and enough pyro to keep Guy Fawkes happy. We’ll have daylight until late into the evening, so Saturday will be packed with more airsofting than any sane person could need, followed by more on Sunday! Cost for two packed days of play is £75 (£25 deposit, £50 on arrival at the event). Camping on site is available, car parking will be adjacent to the camping area which is very close to the game area – so no 3 mile forced marches carrying full kit. Pathfinder the event organisers have decided to slightly reduce the entry price for the 5 Man Competition 2 Day Event 31st March to 1st April. Price now £80 per person which includes accommodation on site. 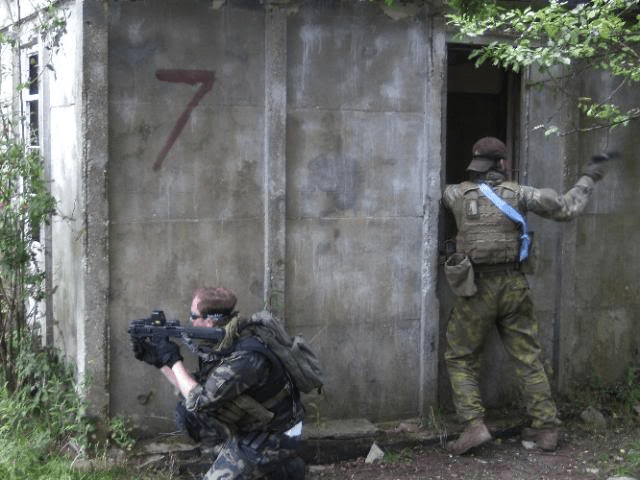 Hi, We would be grateful if you could let your viewers know of our 5 Man CQB Open Competition at Sopley Camp, which is an old RAF Base near Bournemouth, Hampshire. Pathfinder Group Military Simulations are holding this event between 31st March at 10.00am until 1st April at 16.30pm. 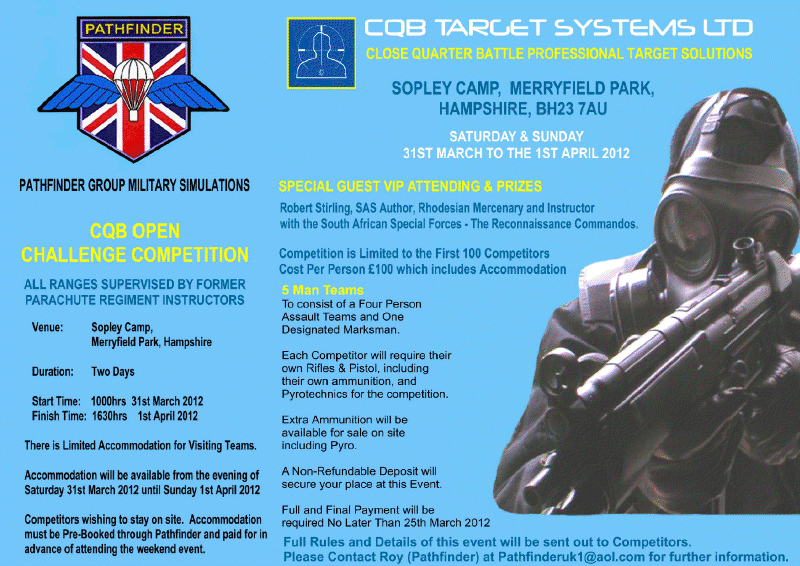 The Event is co sponsored by CQB Target Systems Ltd, Professional Target Solutions. 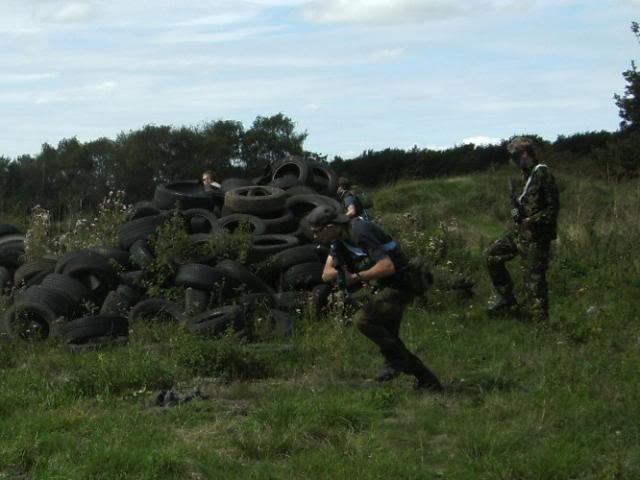 The event is based on Airsoft Military Simulation over 2 days, and is organized and run by Experienced Ex Parachute Regiment Weapons and Tactics instructors. We also have a Special VIP SAS Author who is attending the event over the 2 days. This is not to be confused with an airsoft skirmish event, as this is a serious Military Airsoft Simulation Exercise based on real Military tactics by the professionals, who have served in numerous conflicts throughout the world, so this really is an opportunity for Airsoft Teams to seriously compete at the highest level during the competition. 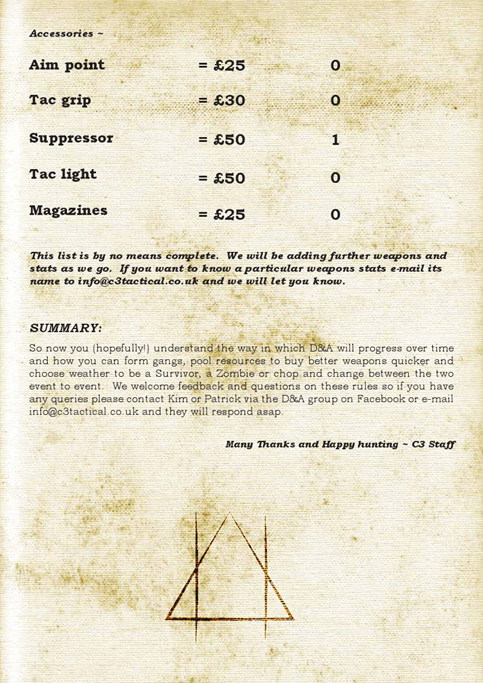 There are specific Blacked Out Kill House environments for the 5 Man Assault Teams, and each team should consist of 4 key Assault Personnel and 1 Designated Marksman, also included in the price is Accommodation on site at the base. Teams applying to take part should have their own Airsoft Rifles, Handguns and ammunition for the event, and any associated Pyrotechnics they wish to use during the assault phases of the competition. Points will also be awarded for presentation etc. There are Prizes for the Winning Teams which will be awarded on the Sunday by our VIP/Organizers. Further information will be sent directly to the applicants from Pathfinder. 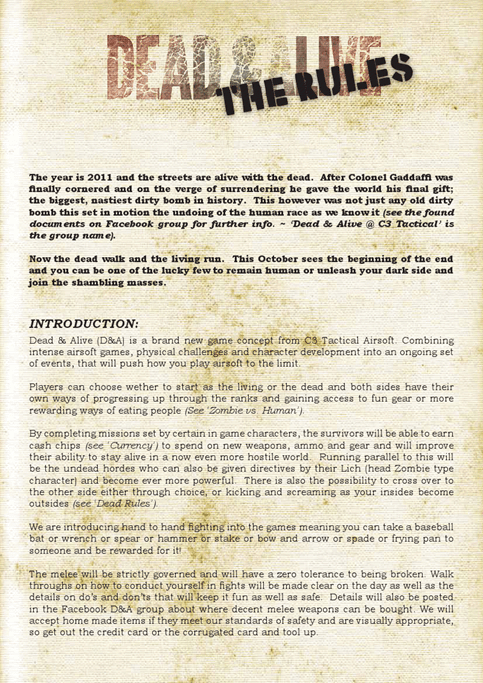 We C3 lads have an exciting new game starting at the end of the month called Dead & Alive. 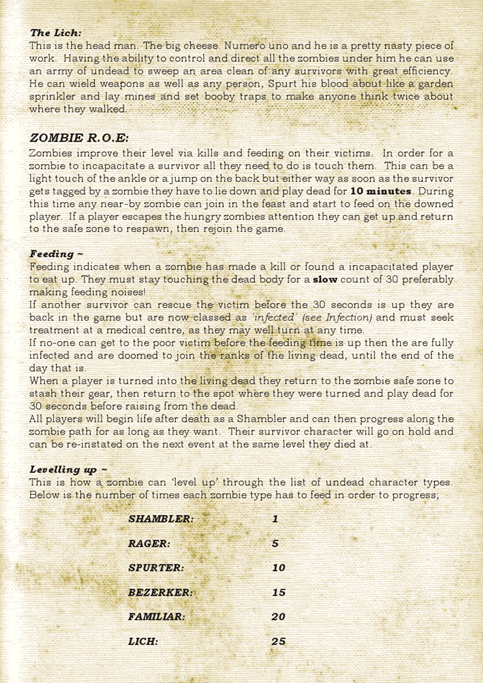 Its a zombie survival game with a difference[..]. 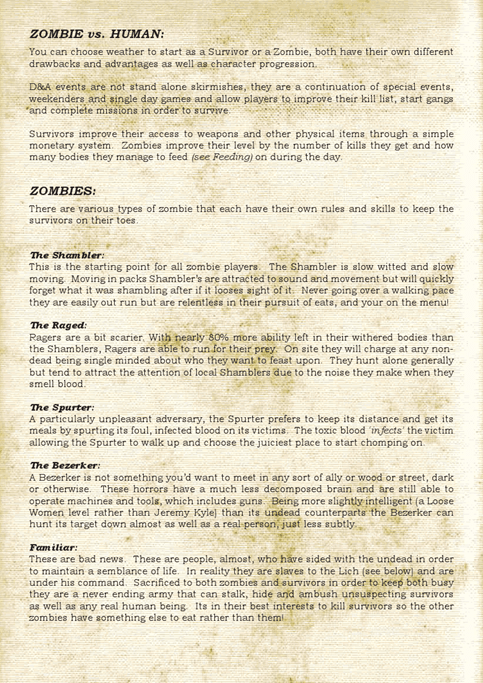 It combines airsoft and LARP(ish) elements for a progressive zombie game that sees players advancing a character as they complete missions and objective based puzzles. It also allows for zombie players to progress, we didn’t want to leave the poor souls out! In addition to our regular Sunday missions, we are working with Tier 1 again to bring you some more involved combat experiences. For those who want to take their gaming a little more seriously, to face the challenges and reap the rewards, the following events should fit the bill!! Also, our gallery has been updated with more pics from recent games. Take a peek, or join us on Facebook to keep up to date! Hey guys http://ai-mag.com/ai500/ is now live all players that have paid their deposits please make your way over to the forum to register. Players that have made multiple bookings please contact connor@ebcon.co.uk with the players names in your party and their email addresses. This is a player ONLY forum and non registered players will not be granted access. 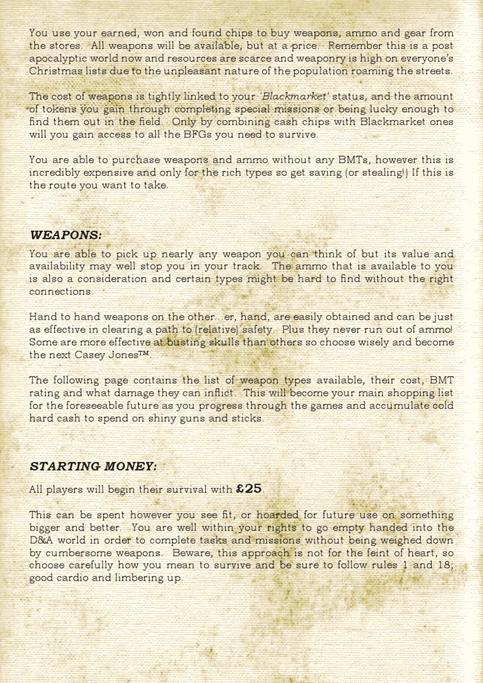 Spring is upon us and plans have begun for our first scenario game of the year… THE NAM 8! This is a massive production and we only do these scenario events a few times per year. Weekend camping! Sponsors! Raffle prizes! T-shirts! Patches! Trophies! Huge battlefield! Special characters and props! Snipers! Medics! Demo’s! Heavy Weapons! Costumes! Entertainment! And more all set to the backdrop of a Vietnam war scenario. Hi Robbie and Nick here from Gunman Airsoft, we just wanted to let you know about a series of events we shall be running, Josh will be concentrating on the D-Day and WWII events while we put our energy into cold war and modern day themed events. Gunman Airsoft are proud to announce Operation – “Red Mist”, inspired from the events of the Soviet Union’s involvement in the civil war in Afghanistan between 1978 and 1989, and are part of the Gunman Airsoft series of Cold War Filmsim Events. The movement by the Soviet Union into Afghanistan was viewed by both the United States and Great Britian as a move to take control of the Persian Gulf, neither countires were prepared to let this happen. But besides providing huge sums of cash and stock piles of weapons to the Mujahideen rebels who were trying to cause an uprising and the end of the communist reign in Afghanistan there was very little else that the Coalition could do. Or was there…. Endex is at 14:00 on Sunday. Camping is available at both sites on the Friday nights. £100 for both weekends (Or £65 per weekend, if you only want to attend one). 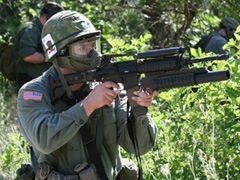 For more information visit www.coldwarairsoft.com or check out our section on Arnies Airsoft forum.